Set in 1942 during WWII, English prisoners of war are forced to build a bridge in Burma to help the Japanese in the relief effort. 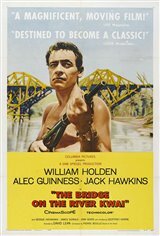 Colonel Nicholson (Alec Guinness) takes great interest in the bridge and begins to obsessively protect and push its construction. Colonel Nicholson' obsession leads him to trouble when the prisoners lose patience and discover his hidden agenda.